Three strangers from vastly different walks of life must make soul searching decisions about right and wrong, and everything in between on the morality scale. Life Without Principle is a film directed by Johnny To, from a screenplay written by Cheung Ka Kit, Yau Nai Hoi, and Wong King Fai. It premiered in competition at the 2011 Venice International Film Festival. To's latest opens in the midst of a crime scene, but this isn't quite a return to his bread and butter action crime genre. 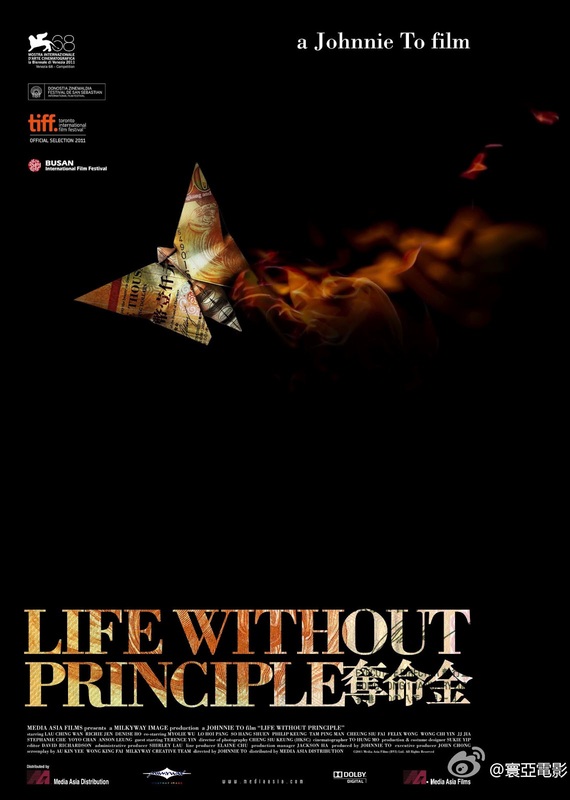 Although there are some scattered moments of violence, Life Without Principle is mostly a slow burning drama that examines human greed and the collapsing economy, through overlapping stories that follow three characters connected by circumstance but who never actually meet. Police Inspector Cheung (Richie Ren) quietly struggles in his job, dealing with the everyday atrocities of the city, and pestered in his home life, with a wife insistent on buying an apartment beyond their means. Teresa Chan (Denise Ho) is a bank investment advisor, the poorest performer of her branch, she's forced to stay late and cold call clients and cut corners to make her quota. Then there is Panther (Lau Ching Wan), a not too ambitious or smart but fiercely loyal low level gangster who hits the streets to find bail money for his sworn brother in crime. To takes his sweet time in getting to the point of the story, spending almost the entire first half hour of the film in Teresa's cubicle watching her doing mostly boring work. It's a tedious but clever setup that gives us the full picture of her character and her job, and an important precursor to later events that become clear when the film switches gears to follow the amusing antics of the sandals and shoulder bag clad Panther. Lau Ching Wan (in a remarkable 10th collaboration with To at the helm) is fantastic and almost heartbreaking to watch as the old time triad member surrounded by greed and treachery. He is the only one in his crew who rather foolishly still clings onto the old ideals of selfless honor and brotherhood, and everyone takes advantage of his good nature. Having laid the solid groundwork in the beginning, the pace picks up considerably in the second half of the film. The wide ripples of a sudden global stock market crash, with the crisis in Greece serving as the catalyst, comes to the fore. The result is a deftly handled connecting piece that leaves no one unaffected, yet doesn't feel forced and contrived like films of this nature often do. Life Without Principle, is not the high octane guns blazing extravaganza that we've come to expect from the director. However it's an elaborately detailed and highly intelligent screenplay brimming with scathing observations that To juggles beautifully. Raising serious questions about morality and human nature, in a solid and entertaining package from one of the world's premier directors. I do love reading about films that would easily pass me by. I think I'm gonna like this one. I think I'll have to push myself through the beginning, but once it picks up I'll be glad I did. Only thanks to you though, the trailer was pretty vague to me and left me with no thoughts whatsoever. This one sounded interesting to me when I heard about it during Venice, and your review confirms my best hopes. I tend to like these types of films that play off of morality and the human nature, and the interconnected pieces sound intriguing. I love when different strands are connected cleverly and believably, not ham handed like films like Crash.